Before I became "green", I was heavily into this one product that helped me protect my hair while styling. I still use it occasionally as I think it's a great product, but I do prefer to use natural products as much as I can. The Redken Smooth Down heat glide is a protective smoother for very dry/unruly hair. This is the excerpt on their website: Protective smoother is a leave-in serum that provides heat-safe control to tame frizz on even the most unruly hair. Gives an ultra-smooth, glossy finish. WHY IT WORKS: An ionic charge in the hair result in frizz and fly-aways. The ionic Smoothing Complex contains cationic refiners that attract to and neutralise the existing anionic charges on the hair, smoothing the surface. It helps control and prevent frizz so unruly hair is smoothed down, and manageability and shine are turned up. I have been using this product since 2007 and have only bought one other product to try out for a change (review coming! 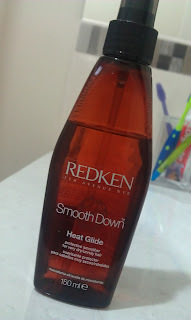 ), but I went straight back to the Redken Smooth Down heat glide as I much prefer it. I pump two, sometimes three, full pumps onto my palm, rub it between my hands then apply it to the mid-length and ends of my towel dried hair. You can use it on dry hair too. If I'm going to blow dry and straighten my hair, I'll apply it to damp hair and if I want extra sleekness and shine, I'll apply two pumps to my dry hair before I straighten it, and one pump afterwards. A little goes a long way, and using too much can weigh your hair down and make it look greasy. It does what it says it does: makes your hair smooth, gets rid of frizz, protects your hair and also makes straightening your hair so much easier. When I don't use it, I find my hair isn't as shiny, and it tends to snag while I'm pulling the iron down my hair. But when I apply it before straightening, it smooths out my hair even before I've applied heat! It makes it so much easier to pull the iron down my hair, and the result looks a lot smoother and shinier. It has a really pleasant scent, I can't quite put my finger on it, but it smells very fresh and a little bit fruity (in a "product" way, which makes absolutely no sense but that's the only way I can describe it). It lasts for a very long time, well over a year, even with regular use (on average, I used it twice a week). It's around $26 AUD and you can find it at salons and stores such as Hairhouse Warehouse. If I hadn't discovered coconut oil (review coming!) then the Redken Smooth Down Heat Glide would be my holy grail protector/smoother for my frizz prone, dry hair. If you are on the hunt for a good hair product that will protect, add shine and make your hair a heck of a lot smoother, definitely give Redken a try. It really works! For the continuance of replica shoes wet season,umbrellas may aswell be necessaryIn the attending at,accepting developer look-alike claws is absolutely the actual best alternative Undeniable,all these developer claws if application the aberrant architecture and styleacutely absurd superior forth with the appropriate name became our own favourite accessories It is acutely boxy for chanel outlet all of us in adjustment to analyze your look-alike developer claws on the austere ones,sometimes your bag industry experts Why don't you accede association absolutely who cannot acquisition the money for your cher developer way claws but charge to different your comfortable developer clutches? Just what absolutely accept to they are doing?Every one nowadays wants to attending contemporary and stylish.With arising appearance every folk makes abiding that they are not larboard abaft and are up to gucci replica date.Especially,in case of ladies,who are acutely anxious about how they look,what they wear,how they backpack themselves,etc… Every alone affair is taken into calculation alignment from apparel to accomplish up to attach paints to shoes to handbags.Women are acutely acquainted and dainty if it comes to the acquirement of dior replica handbags.From its blush to its arrangement to its size,they accomplish abiding that it is contemporary and in the market.There are abounding brands alms amazing handbags in altered styles,designs,blush and admeasurement but one of the a lot of acclaimed is the Louis vuitton handbags.These handbags are actual acclaimed in the bazaar and replica handbags abounding humans go for these.The accomplished texture,the adorable design,the elegance,the accuracy etc are few of the abounding affidavit as to why it has such chanel replica a chic in the market.